We slipped Leixoes at 0715, bound for Figuera de Foz some 65 miles away. We had to wait to exit the harbour as an oil tanker was being backed into its berth near the entrance. 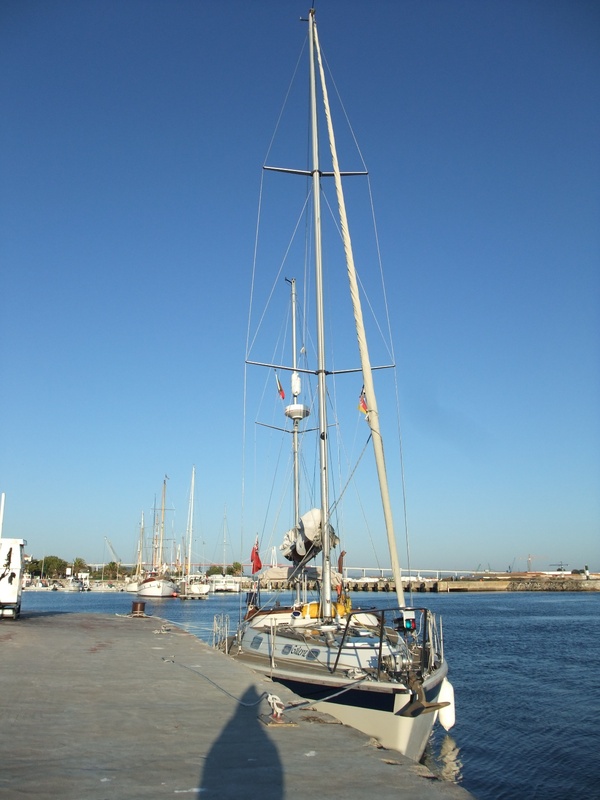 While waiting we chatted to two British guys on a German registered yacht named Jura, heading south to Spain. We were both bound for the same destination that evening so with a cheery “See you later!”we were off. For the next 3 ½ hours we were motor sailing, there is just never enough wind in the morning and if we try to use our cruising chute the wind falls out of it with the swells. With a distance of 60-70 miles between stops each day we need to keep moving at at least 5kts. A pretty uneventful sail until we arrived off Cabo Mondego when we saw the yacht in front of us (Jura) get flattened by a huge gust of wind. Before we could shorten sail we were hit by 30kts from a gentle 12-15kts, totally over canvassed we rounded up hove to! Not really the place to be as we were surrounded by fishing floats off the headland! Reducing sail we had a brisk beam reach to the harbour entrance, turning North around the harbour wall we dropped the sails and motored up the river, looking for the marina basin on the north shore. The marina office is next to the yacht club, where Jura’s crew were sitting outside enjoying a beer (recovering from their ordeal), so we joined them for dinner. Prawns then grilled cod with baked new potatoes, Rowena had the alternative pork fillet option with olives as a starter. Simple food well cooked an excellent end to the day. Not quite so early a start today as we only have 40 miles to our next stop at Nazare. The log shows we left at 0945 and arrived at 1730. We motor sailed in light winds all the way. About 2miles off shore we had a surprise visitor: a big green dragonfly crash landed under the sprayhood! He seemed quite exhausted and stayed with us until lunchtime. No idea where he went. The only other thing of note is I have now identified the shearwaters - Coreys. Down here they seem quite tame and stay sat in the water very close to the boat. I could see the yellow and brown bill which is impossible when they are flying. Nazare entrance - The speed limit is 3Kts! Nazare is an interesting marina, we never saw the town as we were only there for the night. Berthing is organised by Capt. Mike Hadley who not only allocates your berth but helpfully lets you know how the tide is running and the best way to come in. Years of parking super tankers must make yachts seem tame by comparison but he is always right. After checking in at the marina office there is the very useful Louis grocery store and bar next door. Fresh bread is delivered twice a day and everything from fresh fruit and veg, milk, beer and bottled gas is available in a shop the size of most peoples front room! If we didn’t have to be in Lisbon by the 10th we would have stayed a few days. Nazare has been in a drought for several months as there has been no rain since November 2011. We could have drinking water if we needed but definitely no washing of boats. On our way back from the store we helped Jura’s crew moor up and advised them of the water restrictions. Naturally we invited them for a drink later. We now have a severe tonic drought! Thursday 9th August Almost Lisbon. 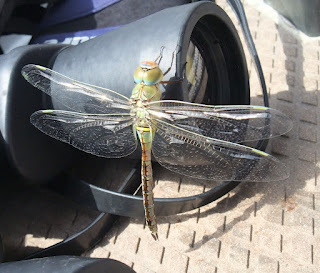 We also had a telephone call from our friends on Sandpiper asking where we were. 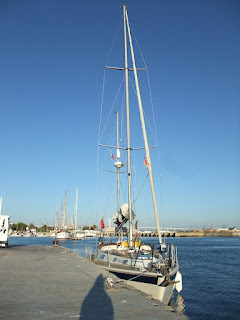 They were in Oeiras marina at the mouth of the Tagus river. We were heading for Cascais having a gentle late afternoon sail but as there was a BBQ invite we dropped the sails and motored the additional 5 miles to moor next to them at Oeiras marina. A real surprise as we didn’t expect to see Anita and Cliff again on this trip. 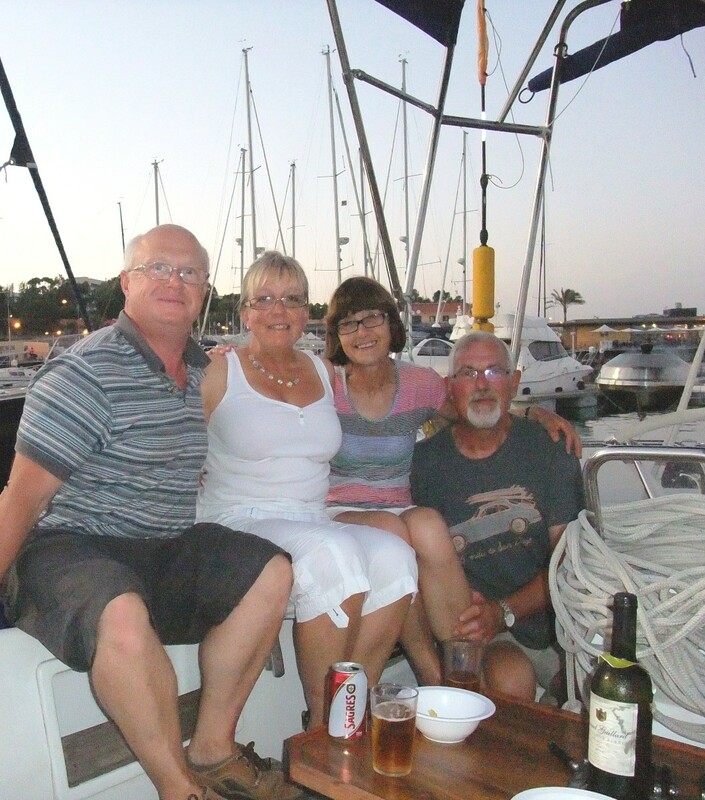 A long day, 13hrs sailing and 76 miles, but a great welcome – fog horn as we arrived and then a lovely chicken BBQ with friends. Tomorrow we will motor up the river and find a berth in the city centre for a few days sightseeing.